William James Judd was the son of an iron worker and came from London's End End. He married in 1928 and had a daughter four years later. 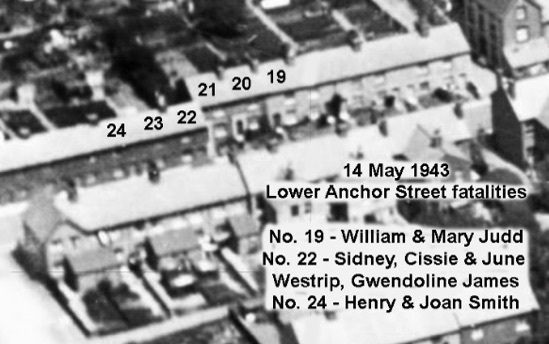 In 1943 he was living at Lower Anchor Street in Chelmsford and it was there that he was killed, along with his wife, in May 1943 when their house was destroyed by a German bomb during the 'Chelmsford Blitz'. William James Judd was born in East Ham in 1906, the son of another William James Judd and Amelia Judd. The 1911 census found William, aged 4, living with his parents and five siblings at 119 Aragon Road in East Ham. His father was an iron worker for a gas company where he had worked for six years. In 1928 William married Mary Witney and four years later the couple had a daughter, born in the Chelmsford registration district. n 1943 William, his wife and daughter were living at 19 Lower Anchor Street in Chelmsford. The property was an old terraced house on the road’s northern side between The Orange Tree and The Queen’s Head pubs. In the early hours of 14th May that year Chelmsford experienced what was to prove to be its heaviest air raid of the war. In a sharp attack that lasted for just over an hour, the German air force, the Luftwaffe, dropped a large number of high explosive, incendiaries and parachute landmines which caused extensive damage to residential, commercial and industrial properties in the town, and led to the deaths of more than 50 people. Among the dead was 36 year-old William, one of eight people who died as a result of a 250 kg high explosive bomb which scored a direct hit on 22 Lower Anchor Street. His wife was also killed, as were Henry William Smith and Joan Miriam Smith at number 24, Sidney Arthur Westrip, Cissie Kezia Westrip, June Westrip and Gwendoline Iris James at number 22. William and Mary's 11 year-old daughter lay entombed in the wrecked home, having been trapped in the rubble for some time. She was eventually rescued via a cellar by Senior Warden Charles Alfred Brett, formerly the head gardener for the late Mayor, John Ockelford Thompson. Mr. Brett was subsequently praised by the Regional Commissioner for his efforts. is son Alfred George Brett was to die later in the war. The bomb demolished numbers 21, 22, 23, 24 & 25, while numbers 19, 20 & 26 were damaged beyond repair, and numbers 13, 14, 15, 16, 17, 18, 27, 28, 29, 31, 32, 33, 34, 35, 36 were seriously damaged. Across the road the explosion seriously damaged numbers 89, 90, 91, 92, 93, 94, 95, 96 & 97 which stood opposite the scene of the bomb. William left an estate valued at £751 15s.